Whether installing flooring systems and coatings in new or existing buildings, substrates generally must first be levelled. The goal is to provide a level and highly resilient surface suitable for a broad variety of flooring systems. In order to achieve excellent bonding to the following underlayment, the prepared substrate is primed with KÖSTER SL Primer. KÖSTER SL Primer works as a bonding agent to provide a homogeneous absorbency and bind residual dust. It thereby guarantees a consistent and damage free substrate. KÖSTER SL Primer cures rapidly and is thus quickly recoatable. The leveling is then carried out with KÖSTER SL Premium in one working step in layer thicknesses between 2 and 15 mm; in depressions up to 30 mm. KÖSTER SL Premium is a high quality, self-leveling underlayment for the repair of concrete and existing coated floors. The material is characterized by a high compressive strength and cures with almost no shrinkage, thus preventing cracking. Due to its excellent flowability KÖSTER SL Premium is very easy and safe to work with. 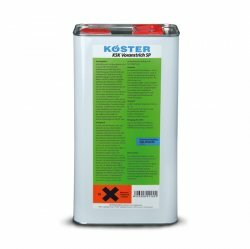 Additionally, KÖSTER SL Premium is suitable for non-absorbent substrates, e. g. on floors that have been protected with KÖSTER VAP I® 2000 for moisture control, on existing epoxy coatings or even tiles. As a bonding agent, KÖSTER VAP I® 06 Primer is used. KÖSTER SL Premium allows for an early use after application: After 3 hours foot traffic is allowed, subsequent flooring systems can be installed after 5 hours, and after 24 hours curing time the material is even trafficable.